Worldwide 2.4 GHz ISM band operation by 2406 MHz ~ 2472MHz. Embedded Up/MAC mode settings IA2E RF normal operation mode that support 15 hopping channel/Per Sequence. It is included 4 Sequence group/per system. Analog output: THD+N up to -70dB, SNR up to 85dB. Support I2S (Audio In/Out) and USB (Tx Audio Input) with 2 channels downstream. Support I2S downstream 32/44.1/48KHz at resolution of 16 bits (2 channels). IA2E wireless audio module that support in master mode for Tx and Rx audio interface. 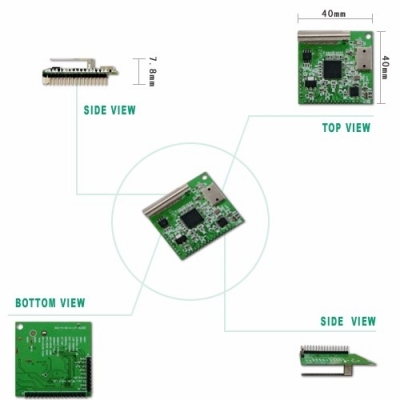 Control Channel (CCH) up to 2 kbps for downstream by I2C interface via wireless. USB 1.1 device controller, Supports LPCM and compressed format at 16-bit 2-channels at sampling frequency of 32, 44.1, and 48KHz downstream. Integrated pipelined 8-bit CPU, with embedded 4K bytes program RAM, with embedded RFIC in IA2E audio processor. Serial 4K byte EEPROM for Boot Register Update.I2C interface support blank EEPROM code download, External I2C device read/write, and data. Support Rechargeable “AAA” size Ni-MH battery for 900mAH to 1000mAH capacity by Tx module internal charging circuit and firmware control.